I'd like to make myself a small belt knife, and since I'm aiming to finish building my first proper targe in a few weeks, it occurred to me that it'd be nice to have a knife that could go along with the targe and some other things I'm hoping to acquire in the coming year. I know there are some really good-looking ones made by Glen McClain, Kyle Willyard, etc. but they're a bit beyond my means at the moment. The other off-the-shelf option would seem to be a low-end "trade" knife from a reenactment supplier like Townsend. Since I like to do at least part of the work on my acquisitions when possible, I thought of starting with an Atlanta Cutlery sgian dubh blade. However, the antique utility knives from this period seem to always have off-center tangs with no shoulder on the spine side, which makes sense on a working blade, while a tiny fighting knife with quillons and a three-inch blade just seems silly. Are there other possibilities I might have missed? i've been wanting to try one of these as the basis for a simiilar project. for $16, seems hard to go wrong. Tim Ridge of Swamp Fox Knives makes a wide range of knives at an equally wide range of prices. While not quite on par with Glen McClain or Kyle Willyard's blades, I have owned several of Tim's knives over the years, and they are well made. Tim is a great guy to deal with as well. Here is the link to his website: [url]http://www.swampfoxknives.com/[url] looks like he doesn't have much in stock at the moment, but at least you can get some idea of his knives and their prices. That is a very attractive one; I like the antiqued bone scales a lot. It's a little bigger than I'm thinking of but definitely worth considering. Swamp Fox looks good, though still more than I can justify paying at the moment. Maybe some time soon? I did check out Crazy Crow. It seems to me that most of their bare blades are 19th-century styles, though they've added more finished 18th-century ones recently. One that I would consider is a Green River "beartooth," as it has that off-center tang and is a perfect length and shape; it might look good with a brass ferrule and some filework. I own a Green River blade which I modified the tang on; it's a hard, very sparky steel and comes razor-sharp... no complaints there. The kind I would really, really like would be a slightly scaled-down version of a sgian achlais or gralloch knife like this one. 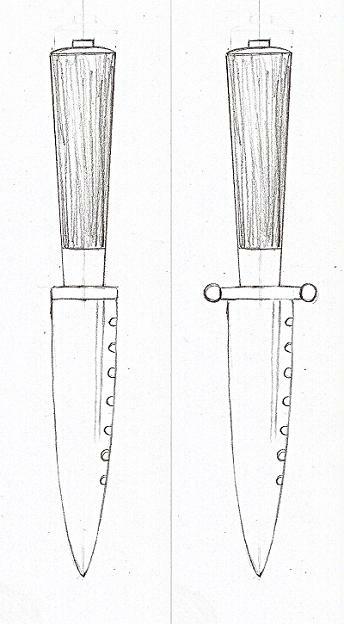 I just thought of using a Bavarian hunting blade, which is even available with a jimped spine, but do you think that would look passable? Perhaps if the protruding bit of the shoulder were ground down? I would highly suggest reading through this thread. There is a tremendous amount of misinformation out there on what was typical and what is available on the market. If you're on a tight budget but want a quality made 18th century style belt knife, try Jeff White. You can get a 6-7" bladed knife in a nice sheath for under a hundred bucks. Most of his are hardwood handled - the most common handle material. Several outfitters carry his knives - just google it. I'd like to reinforce what was said about Jeff White knives, they're excellent knives and are good copies of 18th century knives. I own one of his French Trade knives and I can tell you these are real knives not costume props. Mine takes and hold a good edge and I plan to test it out more thoroughly this spring and summer. Yes, that is my understanding; that the basic work and kitchen knives of the period have slab tangs, often partial-length, with a plain blade and no metal fittings other than the pins. Jeff White's knives seem like a good option. The "Sloyd," in particular, is on my short list. That being said, my preference would be something a little fancier in the Scottish style, and moreso if I get to do some of the work on it myself. I know that knives like the Chris Goerner one existed, even if they weren't the most common. What I'm wondering is whether it's worthwhile trying to make one without the benefit of a custom blade. If you're going to make a Scots inspired knife, stay away from using Atlanta Cutlery skean du blades and the like. They are not 18th century. Those blades are for making modern Skean Du stocking knives (and most of us Scots simply buy a ready-made Sgian Dubh at a Highland Games). What would you say to this design? I understand the nicker is also (more) modern, but perhaps if the protruding shoulder were removed it could pass for a fancier belt/eating knife of the period? The who, when, and where is important. You say something to go along with your targe so I’m assuming you are portraying a highlander. Is that correct? Are you portraying a highland transplant to North America? However, you also mention trade knives – The link that was posted from the frontier forum contains what is probably the most comprehensive information concerning the 18th century trade/butcher/scalper (different marketing terms for the same tool). I started this thread to show what a good reproduction looks like http://myArmoury.com/talk/viewtopic.php?p=286...t=#286883. My primary area of interest is 18th century English colonies, so I’m not as well-versed in what the Highlanders might be carrying I am familiar with Jeff White’s knives. They are fairly popular in some 18th century reenacting circles (because they’re good knives and priced very reasonably), however, they don’t represent the true period trade knife for English, French, Dutch, or anything I’m familiar with. Again, good knives, but not a true trade knife. There has been many discussions in living history/archeology circles about what a “homespun” knife would look like in the period, because certainly there was such a thing. The reality is that the vast majority of knives in 18th century Europe and European America (including North American Indians) had quality, readily available knives (both fixed blade and folding) produced commercially in places like Sheffield then traded all over the world. Another reason why the who, when, and where is important is because only a limited amount of European and North American folks would have been carrying knives on belts in the period (or wearing belts at all). Highlanders may be some of the few exceptions in Europe and Highland transplants to North America generally followed social norms with short-lived exceptions in places like Georgia and North Carolina (think those who fought at Moore’s Creek Bridge). During the War for Independence, riflemen and backcountry “over the mountain men” are described as carrying scalpers (butchers/trade knives) on belts and of course Eastern Indian tribes carried French or English trade scalpers. The only other real non-conjectural option for “belt knives” in North America at the time would have been table knives with the rounded tips ground down to a point. Homespun knives may have been made by local blacksmiths (they certainly were in the 19th century), but it would have made little economic sense given that trade knives were so cheap and available. The same principle applies to gunsmiths in the colonies – masters would have been capable of making lock, stock, and barrel, but it was so much easier and cost effective to use commercially available locks and barrels, etc. For spot-on trade knives, Ken Hamilton’s knives run around the $100 or so mark, but are the best reproductions out there. Kyle Willyard, whom you mentioned also makes trade knife repros though his fit and finish is actually better than the originals and they’re priced a bit higher. He also uses his own touch mark rather than an original. He makes fantastic stuff. Eric Schatzel of “At the Eastern Door” also reproduces fantastic repros. Good question. A full answer would probably make your eyes roll but the basic idea is that they come from a collection gathered in Britain over a short time in the 18th century. The targe would be a leftover from the '45, probably from a seized store of weapons (at least, I don't intend to nick up the facing to make it look like it was found on a battlefield ) and the other items may have come from the same source, or simply be contemporaneous, as best as can be managed. They need not represent the personal kit of someone from the time. I'll check out Ken Hamilton's and Eric Schatzel's work. I know that some okay-looking scalpers can be had for well under $50 (probably out of South Asia or something), but they're rather bigger than I'd like. Check out this blog post from my friend Jim Mullins - http://ofsortsforprovincials.blogspot.com/search?q=butcher. He also mentions the commission route if one wants a dead ringer repro. He also includes a link to Avalon Forge who offers a very cheap trade knife that I think they call "kitchen knife." The handles are painted red which is an attempt to produce "red-handled scalpers" which are listed in trade lists of the 18th century - in reality, the originals were called "red-handled" because of the exotic wood they used, not because they were painted. I've heard that the blades on these cheap imported trade knives from Avalon are sometimes stainless, apparently. So that's an issue. If you could get a carbon steel one and refinish the blade and handle, you would have something that is reasonably close - from ten feet away. You would have to do far more work to one of Jeff White's knives to get it reasonably close. Then again, if you're just playing around and not doing a documented portrayal, then it probably doesn't matter. Do you think it would be uncouth to ask a custom smith for an unmounted blade? Especially since it would be a fairly small one. I'm thinking the Hirschkrone blade would look good with some reshaping, but of course that risks wrecking it if I fail to redo the bevel neatly after flattening the belly. One last question: If I'm starting with a copper ferrule, should I plate it in brass or leave it as is? The photos of originals I've seen are all B&W. Thanks. I'll start experimenting asap. So here's what I wound up with. I know the blade geometry isn't right for the 18th century (it's a modern Finnish carving blade by Laurin) but it's just the right size for my needs, and, as it happens, roughly the size of a sgian dubh.